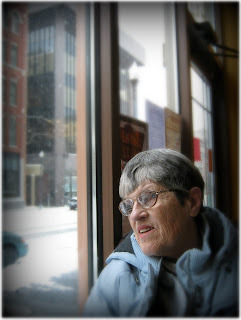 Since I interviewed my mother a few years ago, hers has become the most popular post on What She Might Think. Because of this and because I won't see her this Christmas, I wanted to interview her again. To prepare, I searched online for images of the house where she grew up in the 1940s and '50s, and where I would spend many of my Christmases through the 1980s and '90s. I located the house on google maps, and stood in front of it in a virtual world. A junk car was parked outside. A destitute grocery cart was kicked up on the curb. The tree blocked most of the porch where a swing once hung and my grandmother's plants grew in heavy planters, and where I roller-skated back and forth one visit. The house like a gravestone, a wind-block for someone else's faded flowers. Built in 1915, only a few years after my grandmother was born, my grandparents' house was first my great-grandfather's, Great-Grandpa Steffee. 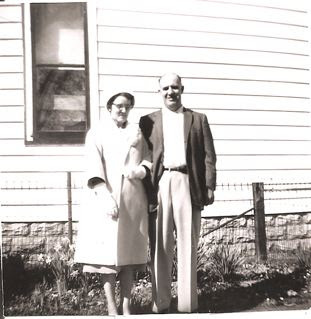 Evidently, when my great-grandmother died of tuberculosis, my grandmother decided that, as my mother says, great-grandfather "couldn't boil water", and so she insisted that she, her husband (my grandfather) and their young family move in with him. Q. Often, I feel like many of my Christmas memories take place in Evansville, and I don't know if that's because we went to visit your parents every Christmas or because I would imagine Evansville when you told me stories of your life. Do you have a similar experience in that you have memories of Christmases that your mother would tell you about? What were Grandmother's Christmases like, as far as you know? Do you remember her telling any stories about them? What about your father? A. . . . Mother. . . We did not talk big time in the family. The most talking we did was when we were doing dishes. If we wanted to embarrass mother, we'd ask embarrassing questions. Neither parent talked much about their past. I think mother's past was like ours. 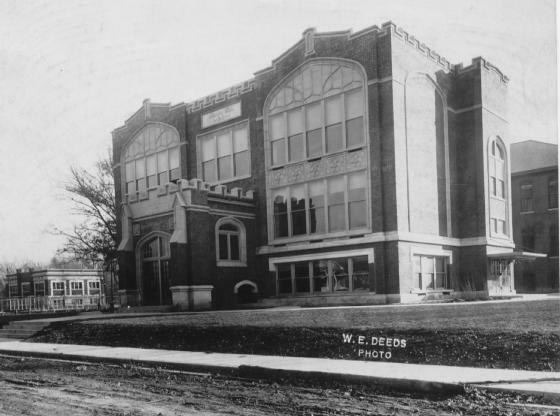 The Depression started in '29 when Dad was about to graduate high school, but I think things were already bad. No, Dad didn't talk about that anymore than he talked about World War II. I remember you talking fondly of your childhood Christmases. I remember you saying you would get an orange in your stocking every year, and I think you also got candy. It seems that one year you got a doll but weren't very impressed with her: I think you'd wanted something else. Can you describe your Christmases more? service at church) or Christmas Day. spread over the mantle, for she decorated it, as well. She and we 3 children did the decorating, adding popcorn strings of our own threading. Another big part of the season was watching Mother fill out an order blank to Sears & Roebuck from the big catalog wish book. Apparently, she didn't buy any of our gifts from there since she let us see the order! She had beautiful printing and handwriting. Then when the order came, she wrapped the gifts and mailed them to Aunt Helen and our cousins in South Miami, Florida. We children helped by putting our finger on the first knot of the string while she tied the 2nd knot, when she wrapped the box to mail. It was okay to use string in those days. Then, we looked forward to the generous-sized box that Aunt Helen sent to us with gifts galore--one or more for each of us and some for our parents and Grandpa Steffee, as well. The Biebels were crafty in their gifts and often made some of them by hand. Interestingly, as I look back, I don't believe Judy, Gary, and I exchanged gifts with one another. Neither am I sure we even gave one to our parents and grandfather. 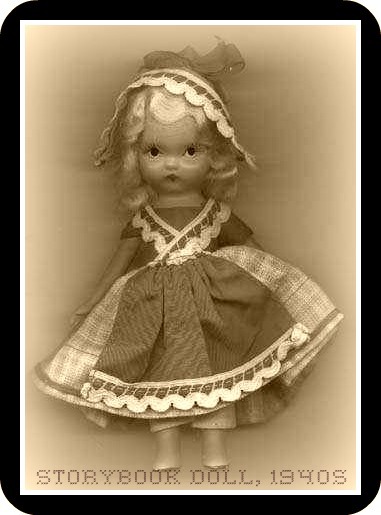 As for the doll story, I did like the dolls I received though they were never as beautiful as the boxed ones at downtown Woolworth's or Neisner's 5 & 10-cent stores. I didn't take good care of my dolls, though and they always ended up in the attic! On the other hand, I doubt Judy ever played with her dolls much for she kept them in perfect shape in a wooden trunk Grandpa Steffee had made for her. It pays to be the oldest child, I guess. 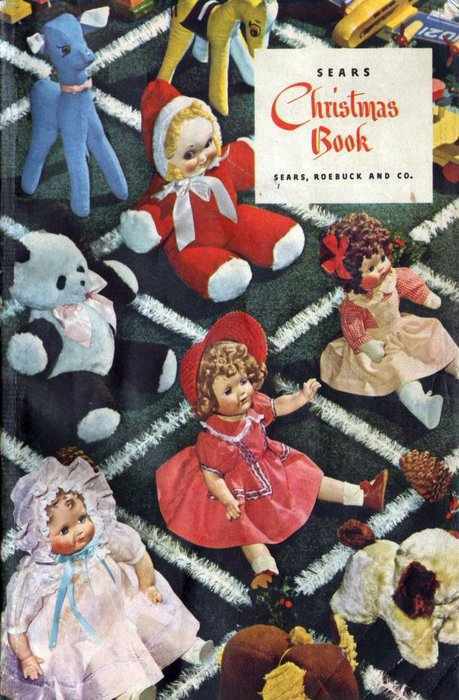 My favorite dolls were the Storybook dolls and a baby doll that crawled when wound up. And then, I was always interested, maybe even envious of Gary's gifts, since he received 'boy' gifts and thought they seemed more wonderful than mine. Cookie-baking was a big part of our Christmas (as well as eating them constantly, so much so that one Christmas I became sick from eating so many oatmeal cookies)! Besides oatmeal, we baked brownies, sugar cookies with icing, maybe chocolate chip. Mother also made some chocolate fudge especially for Dad, though I'm thinking we were also allowed to indulge. as beautiful as the boxed ones at downtown Woolworth's. . ."
Church activities also contributed to our joy at Christmas. A Sunday School party even had Santa Claus there handing out treats. Even as a child, I thought it was odd that we had both Santa AND church in the same place! I guess I thought he was too worldly to be at our Sunday School party. HA! Our youth fellowship went Caroling to the shut-in members of the church and to others' homes, followed by a chili supper back at the church. One year, though, I got so cold during caroling that I went home to bed and my teeth took a long time to quit chattering. At least once during the season, we went downtown--before shopping centers and malls were 'invented'--to see the stores and their decorations. I don't remember ever sitting on Santa's lap or of even seeing him around town. Did you look forward to Santa coming? Yes, I did, until 2nd grade when I learned from a classmate, Donald Pfingston that there wasn't an Easter Bunny! When I asked that night at home, Mother told me the sordid truth, adding 'no Santa, no Tooth Fairy'! I was upset by such news because for one, Judy already knew the truth and had kept it from me, as had Mother, and two, some kid I didn't even like was the bearer of this news! Did your family use the fireplace when you were children? We used it a little bit when it was very cold outdoors. It was a gas 'fake' fire, not a real wood fireplace. Didn't matter, as Mother suggested that our Santa would come through the front door in his delivery of gifts. I thought that was totally unromantic and dull, but went along with it anyway. ...such a practical Santa (& Mother)! Would you write Santa a letter? Yes, we did write Santa a letter and mailed it to Santa Claus, Indiana--down by Holiday World, receiving a reply. I kept that letter for years... wonder if it's still in my possession? Did you have snowball fights? No snowball fights but I wanted it to snow enough that we could build an igloo or snow fort like my 3rd grade friend said she did in Arlington, VA, where they'd moved. [. . .] were popular." Were there Christmas films that you and the neighborhood children would go see at the movie theatre? "Miracle on 34th Street" is only one I remember. 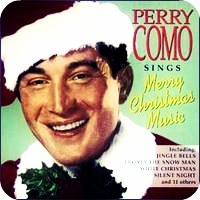 Songs like "I'll be Home for Christmas" sung by Perry Como, were popular. We had lots of Christmas records--78 rpm. What other winter rituals did your family have? We would burn the Yule Log. We'd go out at Midnight and rattle our horns and sometimes the neighbors would be having a party. I miss that because I don't live where anybody stays up to midnight, but I don't either. Was that silver-foil tree that I took home from Grandma's attic from your childhood, or did that come after you had moved out? The foil tree came later, after I left home. Apparently it's an antique because I remember Cindy [my sister-in-law] talking about one she sold on eBay. I just thought the tree was a bit gaudy. I think it was Grandmother's, and she gave it to mother. It was ugly. Especially that pole painted silver that you stuck the branches in. --You can't keep laughing. It's late here, and we need to get this done. "Fourth Street Lighting on Market Square"
I know your father sang while shaving and getting ready to go to the horse-track; did he also sing carols? We were not a singing household. I'm the only one who really liked to sing. But anyway, I never heard him sing any Christmas carols except when he was drunk, but don't put that in. Christmas was hard for him because he didn't get anything as a child. There were too many kids and no money. It was really a hard time for him. He would go shave when he would "go down town". That's what mother would say, but I later learned that he would go place bets with the bookies. I would think, That's odd that he's going downtown when all the stores were closed. I didn't quite buy mother's version. Would your father be more irritable around Christmas since he worked at the post office and was busier? Would you ever go to the post office to visit him? Probably. He worked at the downtown Post Office, mostly and at the window as a clerk, which means he had to deal with people he thought did stupid things; he was quite critical of anyone not too smart or savvy about how to do things in a sensible way. 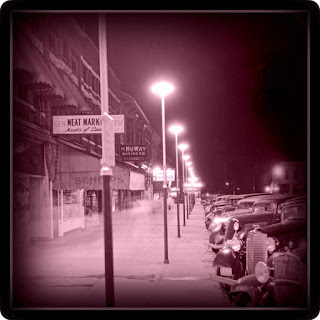 When I was older, Dad worked at some of the branch offices--like Howell, on the west side of town, and we'd go to pick him up--one of us drove there, and he let us in to the back office while he finished his work for the day. Would you mostly walk everywhere in the winter? Did you have winter boots? What did your coat look like? Yes, we walked to school daily all winter....took the city bus downtown, though, and Dad drove us across town when we all visited Grandma and Grandpa Ryan. Winter boots? Don't remember. . . but do remember wearing 'sensible shoes': oxfords. What do you remember about your mother during winter? Did she have a lovely coat? 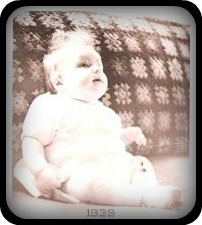 I think Mother had a grayish fur coat at one point, but I mostly remember her cloth coats--red or beige. My coat was nothing special that I recall, but do remember buying a car coat for taking to college--bought at Saum's bargain basement in town. We were just a middle-class family so didn't expect extravagant things. On the other hand, Jim's grandmother Pringle had furs and his mother also wore them (maybe as a hand-me-down from Grandma Pringle). I remember you would sing me "Angels We Have Heard On High" as a bedtime song throughout the year, which is my favorite Christmas carol. 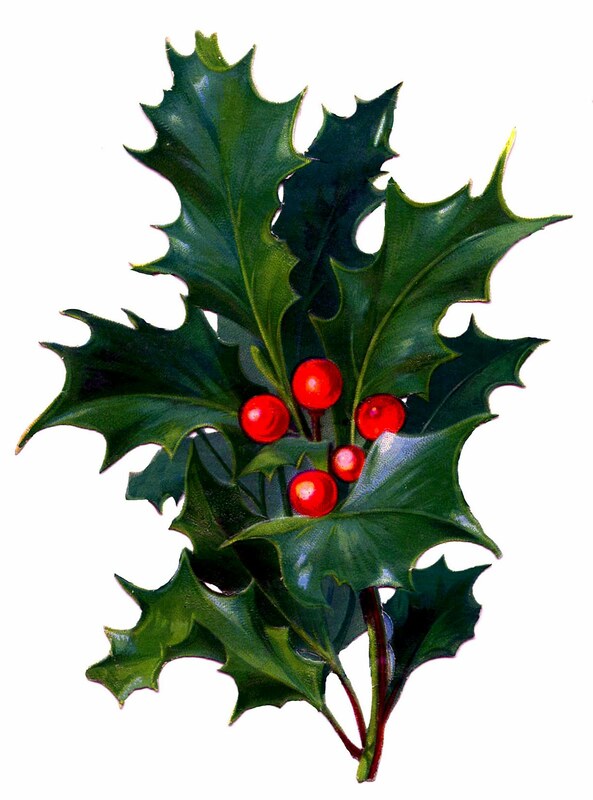 What was your favorite Christmas carol as a child and what is your favorite carol now? Would your mother sing to you? I don't know what my favorite is. . . well, I do know. 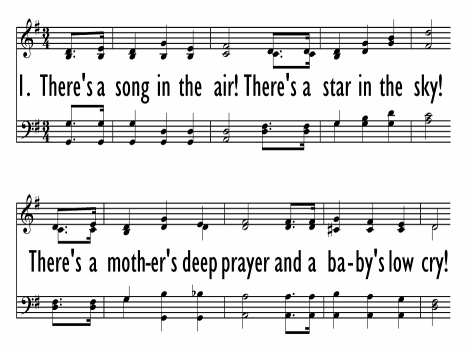 I do want to mention that in first-grade we sang "There's a Song in The Air". It had hard words in it, so I was very impressed. My favorite one was "Away in a Manger" because Mrs. Salm invited me to sing the last verse when children were baptized in church. One time when I was supposed to sing it, I just panicked because I couldn't remember the words. That scared me. In high school, we put on the plays, too. It was a great honor to be Mary. At least I thought it was. They always chose the gorgeous girls to be Mary. I sang in the choir. One of the boys sang "I Wonder As I Wander". Do you know that one? I always liked that one, and I liked him singing it. The other one was “The Star” and that written by Mr. Hyatt, he was the music teacher, the choral director of Bosse High school. We loved him. You asked about mother. No, she didn't sing to us. The only time was at church, she'd sing a hymn. Aunt Helen would sing. Will you be caroling this year? It's probably been over five years since I've been caroling. We'd go to the nursing homes around here. It wasn't really satisfying. I didn't know anyone for one thing. They were either asleep or 'not there'. I do remember with fondness the caroling we would do as children. I guess it's just more wonderful from a child's point of view. I felt honored to sing to people who were shut-in. I hate that word. And invalids. That was the first time I learned that word. Maybe we'd go to older members' houses. There were a lot of us in the group. That was special. I remember you said that the girl who lived next door, and maybe some other children in the neighborhood, were mainly your playmates in the summer because they were Catholic and went to Catholic school during the year. 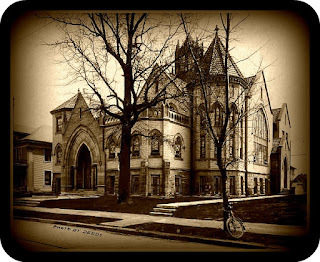 Did you ever go to mass with your neighbor-kid friends, or was that not typically done? was church secretary there for many years. Her name was Suzanne Holmes, and she was my best friend and next-door-neighbor. And the first time I attended a Catholic church was at her first communion. They wear those pretty white lacy dresses that have a veil. And then, when we were in high school, everyone would talk about going to Midnight Mass at the Catholic church. I think I went then. And then also, Catholic-speaking, after the people I used to babysit for moved, Joe Moore moved in across the alley, and I helped him with him catechism, and I don't know if he had to have that for school. So that's why I'm so ecumenical in my religious views, because so many altogether--Jehovah's Witnesses, Catholics, Jewish, Presbyterian--we were very tolerant children. We even had bible-study together. I think that's interesting. When I go into the thrift stores, there are all these old (and even recently used) sets of Christmas plates and serving ware. Did your mother have special Christmas dishes? No. She didn't have any special dishes. 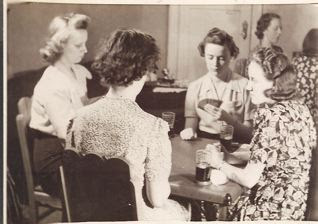 The only thing she had special that she did not let the family use was those blue glasses and plates that she would use for her bridge club. Eventually she gave them to Jennifer [my sister], or maybe to me and then I gave them to Jennifer. What was Evansville like during Christmas; was there a difference between how it seemed during Christmas while your father was in WWII and after he came back? Well, I was born at the beginning of the war, you know. So I was only five when he left. Girls at five-years old want to marry their fathers. I remember sitting in the swing with him. I remember that much. 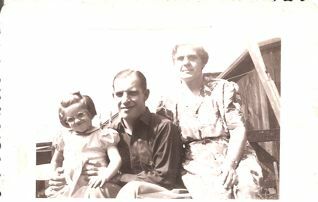 He left on Christmas Eve of '44, so Gary was two-years old, I was five, and Judy would have been seven. Yeah. Anyway, but I don't remember Christmas with or without him. All that time was a blur. If we did go downtown, I was really dazzled by those stores. I know I missed him because I either prayed or wished on a star, probably on a star--little kids did that--that he would come home, and I was sure that the star had moved, and I was sure it was headed to Germany to tell him to come home. And he did, three years later. Would you play with the ceramic Nativity Scene that Grandma would set out on the record player, or did the Nativity Scene come after you grew up? The only one was a little one, maybe a donkey and a couple sheep, and I only have that one sheep left. It was kind of made of plaster and deteriorated over the years. But anyway, it was enough to make me feel like the decorations were complete. After we grew up, I just never felt like I had the right nativity scene, and I still don't. I have several, but not the one I think I should have. Oh, I want bigger figures. But they're expensive. I don't want them now, that's just more stuff. Were you or your siblings ever in a Christmas Pageant? Oh, yes. The best part of Christmas at church were the pageants. I was talking about that today. There are two I remember the best. “Why the Chimes Rang”--did O'Henry write that? Well, look that up. I think it's O'Henry. It was the chimes of the church and they hadn't rung for a long, long time. I played the part of the old lady. She didn't have a talking part. The other one was “The Other Wiseman”, I think that too was by somebody famous. That was about the fourth wiseman—we only hear about the three—he spent his whole life looking for the Christ child, and then it got to the earthquake that happened when Christ died on the cross. So, we got to the earthquake, and we were supposed to run across the stage, that's where the pastor usually speaks from. Well, we were running across it back and forth and back behind the organ pipes, and it was so fun because you would never imagine that you could run in church like that, and so it was like we were breaking some rule. We loved it. The earthquake was our cue to run back and forth. Any other time that behavior would be considered totally inappropriate. Okay. Would you and your sister and brother go sledding? Was there a hill close enough? 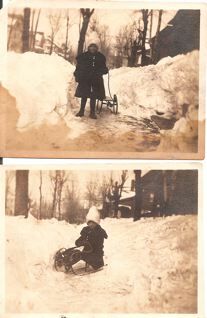 Did you have your own sled? You know there's that terrace in the front yard. That's what we sledded on. There weren't that many snows in Evansville when we were growing up. I think grandpa didn't really like it because we would ruin his terrace, but mother let us. Then, when we were in high school, the youth fellowship went out to the country club, and they had some big hills, tall hills, it was like professional sledding. Grandpa made the sled. It was very sturdy. Did you watch him make it? Oh, no. I watched him sometimes make stuff. In the basement. He had a workbench. I don't even know what he made. Except for the trunk Judy kept her dolls in. What Christmas books do you remember reading as a child? The Night Before Christmas" "Rudolph, the Red-nosed Reindeer", which was invented later in my childhood. 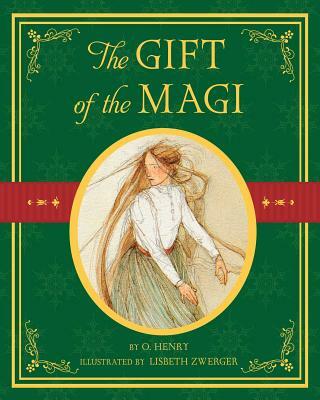 "The Gift of the Magi" impressed me as a short story; I identified with the poor little girl. There was no Dr. Seuss yet with all his Christmas books. Did Christmas change meaning for you when you became a mother? Yes. Oh, because you just try, you focus on delighting your own children with Christmas experiences, and it's fun to see it from the child's viewpoint, and you didn't before, because it was all about you—me. I don't think I was successful, I tried really hard to make it feel the same as when I was growing up, but it just wasn't like it. Has it changed meaning over the course of your life? What gift can I get for someone else?--That's always my question. Trying to please others. Of course, the spiritual side of it continues to go deeper and deeper. And I realize all that changed when I left home to go to college. Well, because, that was just the turning-point because I wasn't the receiver anymore; now it was time to give. It was just different. College changes you. Leaving and coming home. It's never the same. That was a big change in my life anyway. Many of my Christmas memories seem tied to objects from Christmases past. Do you do the same thing, or does that change as one ages--what has your experience been? Does one rely less on objects to summon the past? Or do you do that more with songs, it seems like that would be more likely since you've sung through my life, turning words into songs. Well, the gifts from past Christmases isn't what make Christmases special. It's the experiences. The plays and the singing, even at school we sang around the Christmas tree at Stanley Hall. Did you get the pictures I sent you? They tore down the school. Anyway. We sang in the high-school program at Bosse, and all the other caroling activities. Those were the most outstanding experiences. These days, I decide, what I'm going to look for—the little things that remind me what Christmas is about. What something someone might say. I know your habits during each season, like I know that you haven't turned up the thermostat and you wear your hat inside, but what do you think about winter? Does it resonate for you in a way that other seasons don't? Well, I like the challenges of getting around when it's winter. That makes spring even sweeter, like we made it through the hard times. It's like the rough-and-ready, going out West, the pioneering spirit. I'm going to get downtown no matter what, just meeting every snow that comes like that. Then, you feel like you earned the weather that comes in Spring. And that makes Spring seem better. The only thing I would add is how I decorate now. I put out all these things that have memories. . . that's quite an emotional day. So I'm sitting here looking at Mother's green Christmas tree skirt. . . and I'm putting out Christmas cards I received. And then the ornaments that have been here forever.